PODCAST INTRO: John Michael is a 27-year-old, Texas-born performer whose specialty is the one-man show. His spin is audience participation, as he tells his life stories in his one-of-a-kind whirling dervish style. He hit Chicago with a show he developed in his native Dallas, “John Michael and the Order of the Penix,” about Michael negotiating his dating life. His follow-up, which was developed in Chicago, was “Dementia Me” – a chronicle of his two-year period keeping up with dementia patients as he worked at a Dallas care facility. His latest show is “Meatball Seance.” The podcast has a few bad words in it, as a warning, all spoken by John Michael. Listen now to our Podtalk below! 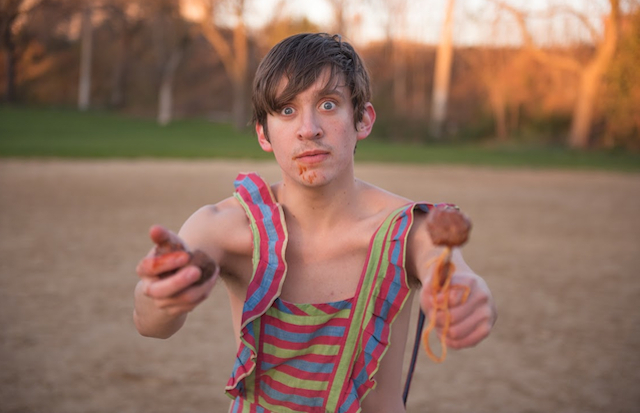 John Michael’s “Meatball Seance” will run on two consecutive Mondays, July 31st and August 7th, 2017, at 7:30 pm at the Mary’s Attic cabaret at 5400 N. Clark St. in Chicago. Click here for more details, including ticket information. Featuring monologist John Michael. Directed by Janet Howe.